The Ace 2017 Spring show in Atlanta will feature an after-party you don’t want to miss! 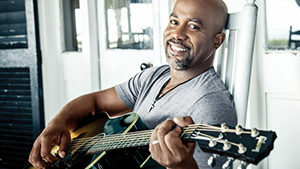 Darius Rucker, the rock star turned country crooner, will headline Ace After Hours on March 16. Rucker rose to fame in college as the lead man of Hootie & the Blowfish. The pop rock band made it big with six albums and numerous singles, including “Hold My Hand” and “Only Wanna Be With You”. Rucker later ventured into a solo career, releasing his first country album, Learn to Live, in 2008. Since then, the Charleston native has established himself as a leading country music artist — being inducted into the Grand Ole Opry in 2012, winning a Grammy in 2014 for “Wagon Wheel” and releasing four more albums, with another one in the works. Tickets for Ace After Hours are $40 each and can be purchased along with your convention badge(s) — register here. There is a limit of 10 tickets per transaction and they’re selling fast, so get yours today! The event will take place at the Thomas B. Murphy Ballroom in Georgia World Congress Center. Doors open at 7:30 p.m. to network and enjoy drinks, and Darius Rucker will play from 8:30-10 p.m.